Bake 8 to 10 minutes or until edges are light golden brown. 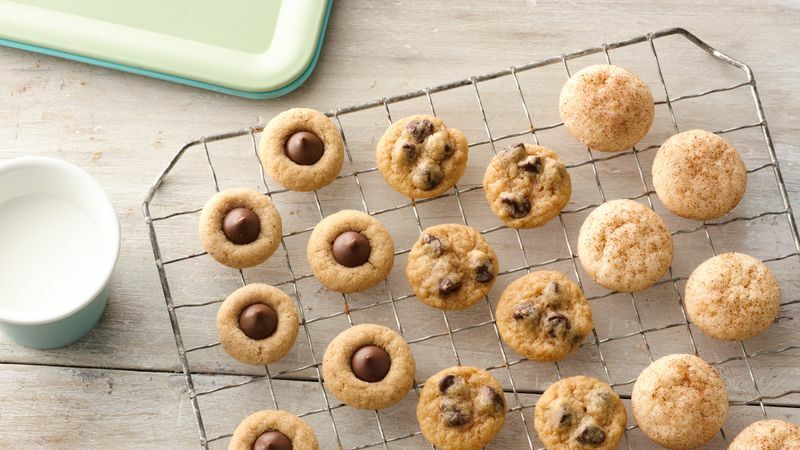 Mini Chocolate Chippers: Make chocolate chip cookie mix as directed. Drop dough by rounded 1/2 teaspoonfuls 1 inch apart on ungreased cookie sheet. Bake as directed, above. Cool 1 minute before removing from cookie sheet. Mini Peanut Blossom Cookies: Make peanut butter cookie mix as directed. Shape dough into 1/2-inch balls; roll in sugar. Place balls 1 inch apart on ungreased cookie sheet. Bake as directed, above. Immediately press miniature chocolate candy drop in top of each cookie. Cool 1 minute before removing from cookie sheet. Snicker-Do-Littles: Make sugar cookie mix as directed. Shape dough into 1/2-inch balls. Mix 3 tablespoons sugar and 1 teaspoon cinnamon. Roll dough balls in sugar mixture. Place on ungreased cookie sheet. Bake as directed, above. Cool 1 minute before removing from cookie sheet. Keep a stash of mini cookies in the freezer for up to two months. They'll be ready when you need them. Mini cookies are great for kids' snacks. Pack them in mini snack bags for lunches or snacks.